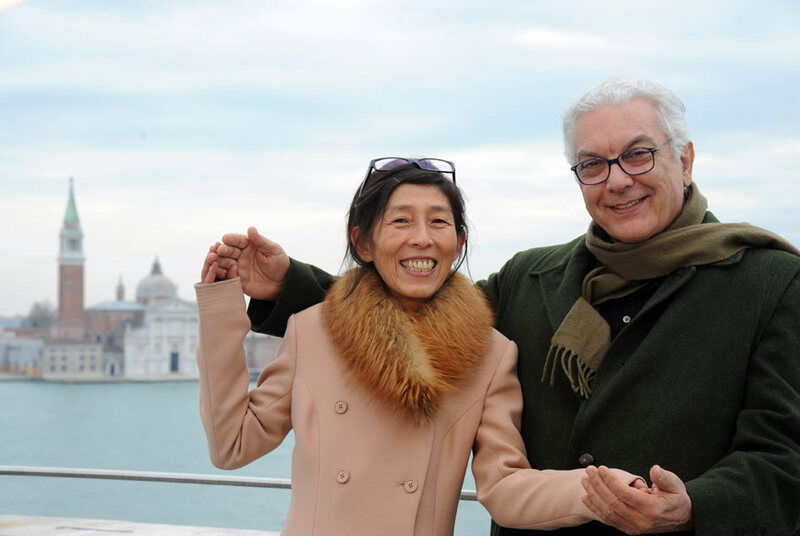 Japanese architect Kazuyo Sejima (L) poses for photographers with president of Biennale Paolo Baratta during her presentation as new director of Biennale Architettura in Venice. Kazuyo Sejima's most well-known work is the Museum of Contemporary Art of Sidney. EPA/ANDREA MEROLA. VENICE.- On May 3rd, the President of the Venice Biennale, Paolo Baratta, and the Director of the Architecture section, Kazuyo Sejima, presented the 12th International Architecture Exhibition, titled People meet in architecture, that will run in Venice 29th August to 21st November 2010 (Preview on 26-27-28 Aug). Two major projects will be developed for the 12th Exhibition: the Architecture Saturdays (a series of conversations, performances and weekly discussions with architects and critics) and the greater involvement of the Universities (educational opportunities for students). After a series of editions of the Architecture Biennale directed by eminent critics and historians, this Sector is once again in the hands of an architect, Kazuyo Sejima. The first woman to direct the Architecture Sector of the Biennale, Sejima has recently been awarded the prestigious Pritzker Architecture Prize 2010 (together with Ryue Nishizawa). The exhibition People meet in architecture will be laid out in the Palazzo delle Esposizioni della Biennale (Giardini) and in the Arsenale, forming a single itinerary, with 43 participants: firms, architects, engineers and artists from around the world. As usual, the Exhibition will present 56 National Participations to be held in the historical Pavilions in the Giardini, in the Arsenale and in various locations throughout the city of Venice. The title of the Padiglione Italia is AILATI. Reflections from the future. Organized by The Ministry for the Cultural Heritage and Activities, with thePaBAAC - General Direction for the landscape, fine arts, architecture and contemporary art, it is conceived by Luca Molinari.The first-time national participations include Albania, Kingdom of Bahrain, Iran, Malaysia, Morocco, Republic of Rwanda. In addition numerous Collateral events have been proposed by international organizations and institutions, which will organize their own exhibitions and initiatives in Venice during the occasion. The 2010 Architecture Biennale should be a reflection on architecture - says Director Kazuyo Sejima. The twenty-first century has just started. Many radical changes are taking place. In such a rapid-changing context, can architecture clarify new values and a new lifestyle for the present? Hopefully, this show will be a chance to experience the manifold possibilities of architecture, as well as to account for its plurality of approaches, each one of them being a different way of living. There will be an independent space for each participant, in order to make them show their understanding of the theme and their personal response to it - says Director Kazuyo Sejima. Individuals will be showing their position towards the interaction of new social and natural environments; all of which means that each person is his or her own curator. This way the atmosphere of the exhibition itself will be achieved through multiple points of view rather than a single orientation. There will be two main projects within the 12th Exhibition: Architecture Saturdays and Destination Biennale di Venezia. Universities meet in architecture. Architecture Saturdays is the title of an initiative organized by the Biennale and consists of a series of conversations and opportunities for discussion held weekly with architects, critics and figures from the world of architecture in Italy and abroad for the entire period of the Exhibitions opening. Thirty-five years after the first architecture exhibition to be held by the Biennale di Venezia  entitled A proposito del Mulino Stucky and organized by Vittorio Gregotti at the Magazzini del Sale on the Zattere  the cycle of Architecture Saturdays intends to explore the history of the exhibitions that have been held since then, inviting the directors of those editions to a meeting with the public. Each Saturday there will be a meeting, moderated not only by the current director, Kazuyo Sejima, but also by each director of the preceding editions of the Exhibition: Vittorio Gregotti (1975, 1976, 1978), Paolo Portoghesi (1980, 1982, 1992), Francesco Dal Co (1988, 1991), Hans Hollein (1996), Massimiliano Fuksas (2000), Deyan Sudjic (2002), Kurt W. Forster (2004), Richard Burdett (2006), Aaron Betsky (2008). With Destination Biennale di Venezia. Universities meet in architecture, the Biennale turns to universities and educational institutes, offering a visit to the Exhibition planned and organized by the institutions and representing a significant didactic and training experience. The project foresees the possibility of setting up specific agreements with the Universities for accrediting groups of at least 50 students, accompanied by lecturers, to transform the visit into university credits. The participating faculties are responsible for organizing the visit programme, which can last up to three days and may include a two-hour seminar organized independently by the faculty itself within a space offered free of charge by the Biennale. Participants in the programme can also take part in one of the Architecture Saturdays if their visit takes place at the end of the week. We have already got in touch with 30 Italian Universities, and 80 different architecture, engineering, design and communication faculties, and received favourable responses from 15 of them, 9 of which are ready to sign this convention. We have also proposed this initiative to more than 300 Universities and Advanced Training Institutes in different European, American, Asian and African countries, getting back 25 positive responses until today, and the first confirmations are to be formalized in the next few days. A new Biennale is born  says Paolo Baratta  an exhibition that hosts foreign pavilions as participants, and different universities as visitors. Its a new alliance under the name of architecture and its related disciplines, as well as a renewed impulse to see the Architecture Biennale as an International pilgrimage spot for teachers and students alike. Even in 2010, Educational Activities destined to any school group (regardless of their level and kind), professionals, companies, experts, art lovers and families alike have been scheduled. Such initiatives, guided by selected operators trained by the Biennale di Venezia, aim at actively involving participants, and are divided into Guided Visits and Lab Activities. At the same time as the opening of the 12th Exhibition, the Biennale is announcing some major structural improvements: by the end of August, the restoration of Ca Giustinian (the Biennales headquarters) will be terminated, with the restoration of the Sala delle Colonne (550 square meters). Dating from the 1930s, this room is unique in terms of spatial and architectural features, and will be used as a flexible space for conferences, meetings, workshops and exhibitions, and especially for live performances. The end of August will also see the completion of the second and final project for the refurbished wing of the Palazzo delle Esposizioni in the Giardini. This will provide a home for the remaining part of the library of the Historic Archive of the Contemporary Arts (ASAC), covering Architecture, Cinema, Dance, Music, Theatre and the periodicals division. The inaugural and award ceremony of the 12th Exhibition will take place on Saturday, August 28th in the Giardini, with the awarding of the official awards assigned by the International Jury. The International Jury will be awarding the following prizes: Golden Lion for the best National Participation at the 12th Exhibition, Golden Lion for the best architect/artist of the Exhibition People meet in architecture, Silver Lion for most promising young architect of the Exhibition People meet in architecture. - People meet in architecture  Videoclip: the best video on the theme of the Exhibition.